« Were you a Boy Scout? Remember this skill? Once he slams the point, it’s all about obedience. Electronic training collars have many uses, but until recently I avoided using one around birds like a dog avoids baths. But once you figure out that steadiness on birds is a two-part process, your outlook might change. Mine did. First, a dog instinctively slams into a tail-stiffening point. That part, we all get. A whiff of bird scent or sight of a bird should take care of that unless your dog’s pedigree included a cardboard box and hand-lettered “you pick” sign. The second part of the sequence (“steadiness”) is where I’ve just become enlightened, thanks again to Bob Farris, trainer and NAVHDA judge. 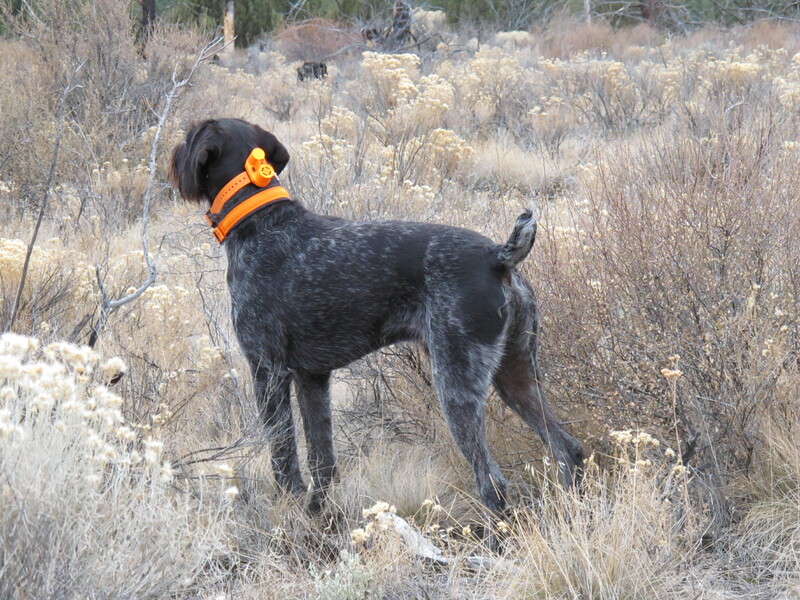 In the hunt test judging process, the point is the first stage of judging – i.e., does the dog have the genetic programming to point when prey is upwind of him. But the judging criteria change the moment the dog sees you in the picture, literally or figuratively. That is where the canine rubber meets the obedience road. Manny (and I’d bet, all “finished” dogs) needs training to stay on point until I want him to 1) see the bird drop, getting ready for the retrieve or 2) continue to hunt after my release, because I missed again. When he enters a scent cone, Manny assumes an elegant point, leg up and forward a bit. But a few moments of staring at the source of enticing smell, a walking, flapping bird or – worse – a flushing bird, will test any dog’s resolve. It’s just natural to chase, so the key is making it clear he’s been ordered to stand still. Some use the usual verbal or hand signal. Some transition to a secret-code heel shuffle other noise or gesture that field trial judges might overlook. I’m figuring that for us the key is treating that part of the point-steady drill for what it is: an obedience situation. Until this revelation, I was loathe to use any “enforcer” stronger than a checkcord, gut hitch or tap on Manny’s flank. I feared an e-collar might sour a dog to birds – especially if I had to use it. But if he’s been thoroughly drilled in “whoa” with many and different distractions, birds simply become another distraction from the command he knows so well. Tempting, sure, but just a sidebar to an obedience test. Now that I’ve gotten over that, we’ve made some quantum leaps. So far, Manny’s only been lit up (gently) a couple times. These days, merely seeing me holding the transmitter is enough to keep him steady with birds flapping in his face, “covey flushes” at his feet, and even birds perching on his back. Today, twice, we had flawless training sessions. Tomorrow, who knows? But I feel like we’re on the right track.